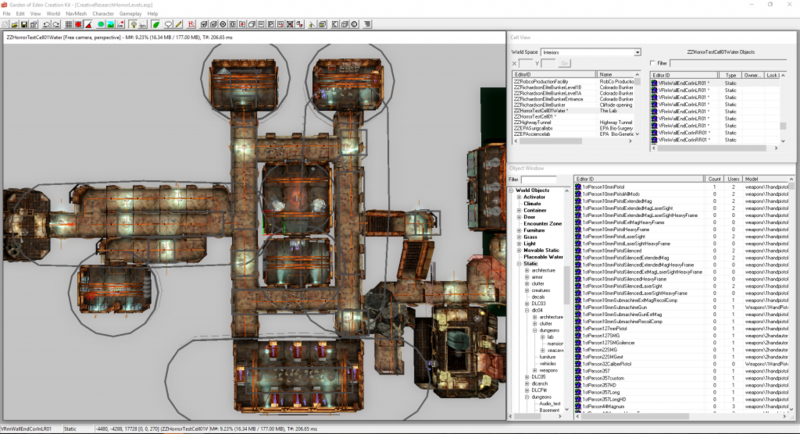 It’s time to build the playable level in-engine. 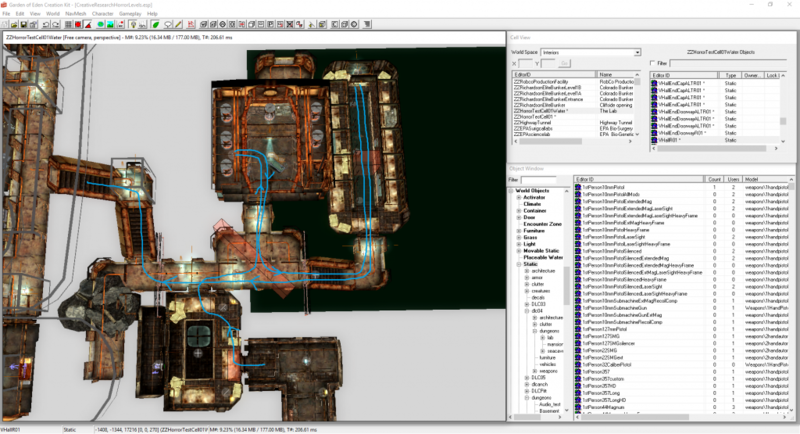 As I mentioned right at the beginning of the research project, I’ll be building it as a mod for Fallout: New Vegas using the tools and assets made available to me to allow quick prototyping, as this project is focused on the theory rather than assets involved in making a horror level. 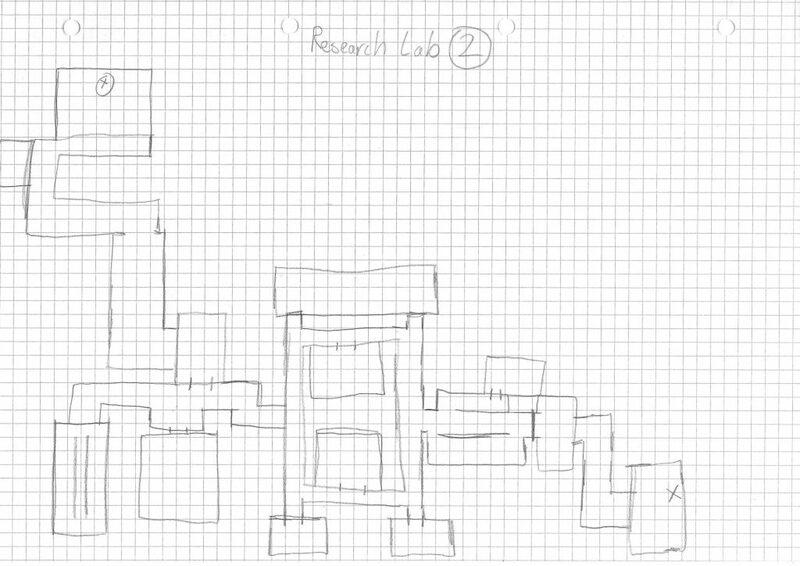 First, I’ll start off by building the reception area of the lab. This area will seem fairly normal, with nothing out the ordinary, in order to play with player expectations. Unlit and mostly unfurnished. 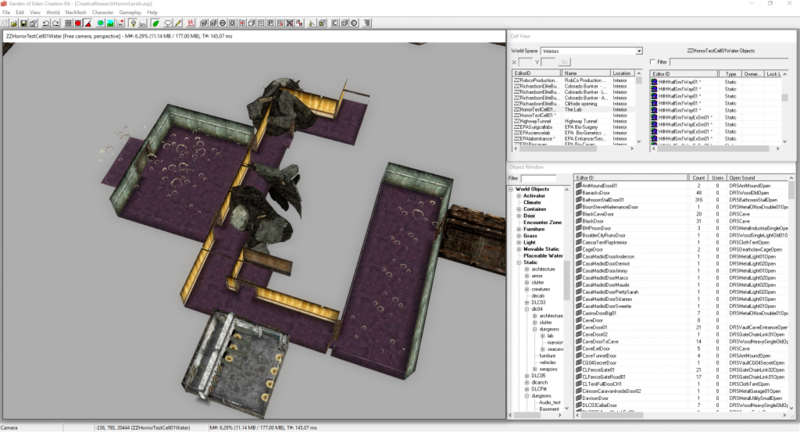 The very left will be where the player starts the level, with the doors behind them locked. 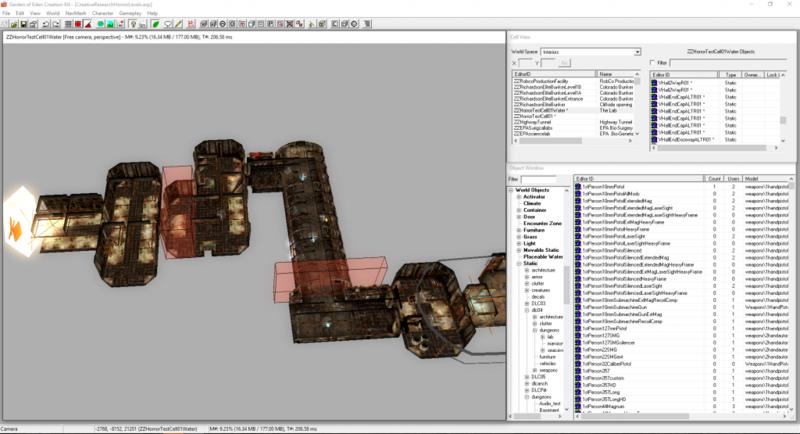 The rubble pieces are there to foreshadow the coming ruined facility, and stop the player from going in unintended directions. Here’s the reception, mostly furnished and done-up. Fallout: New Vegas is set in a post-apocalyptic environment and most of its assets reflect this, so I’ve had to use the least-ruined assets I could find, however I believe I’ve done a good job at it. 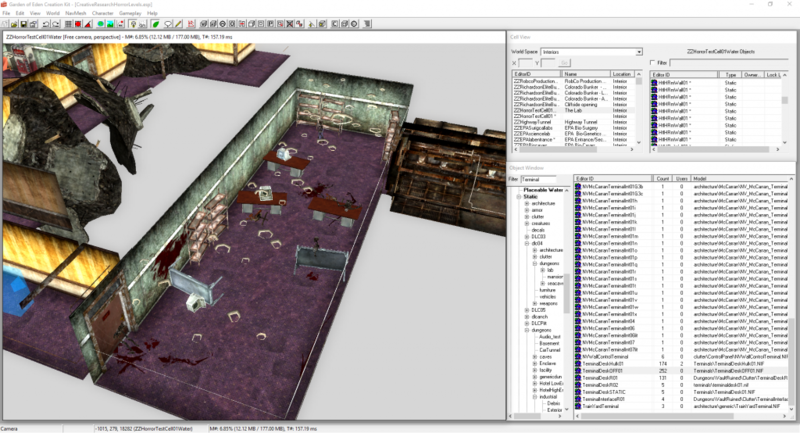 The next room over is where the tension is introduced – The player will be presented with a ruined office scene with blood and skeletons plastered around, showing that something horrible has happened here, however the player will know that the only way they can keep going is forward. This is where the main puzzle solving will take place. This area is freeform and serves as the “Calm before the storm” point of the level. The player has to make their way left to eventually escape, but will find a locked door. They will need to activate two switches before they can open the door preventing them from moving on to the next area. On activating the second switch, the creature starts following them. By the time the player enters this area, they’ll be being pursued. 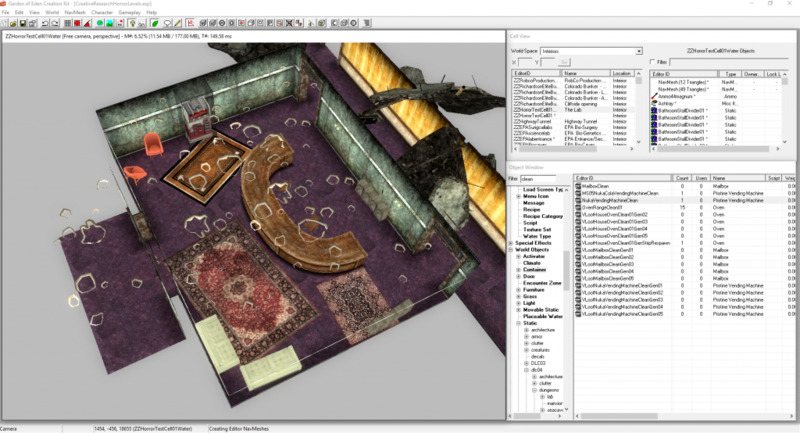 Due to that, the zone is made up of various hallways that run in circles, to that the player is able to trick and get away from the creature to buy themselves some time. Ultimately, the player wants to get from the very right to the very left (Which is closed off by another locked door they need to find a switch to pass through), and onwards to the ending area. 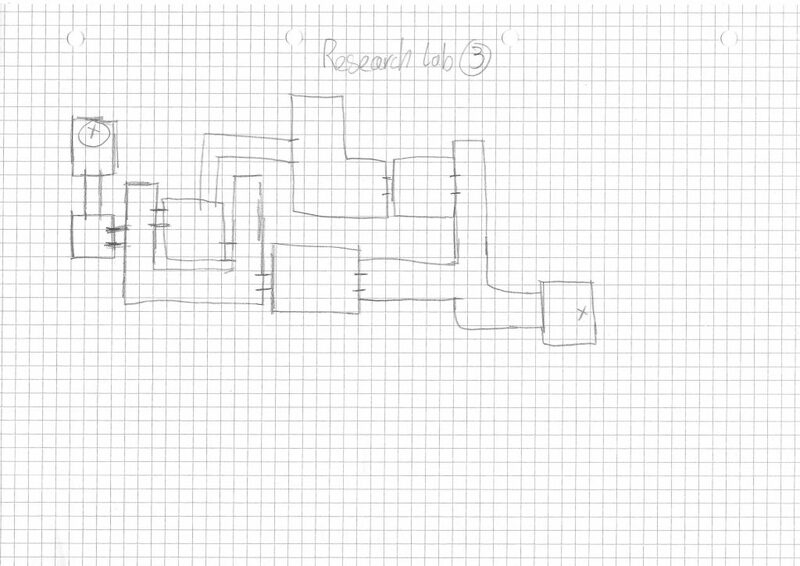 After passing through the locked door, the player will have to progress through this final, linear section, getting to the left. 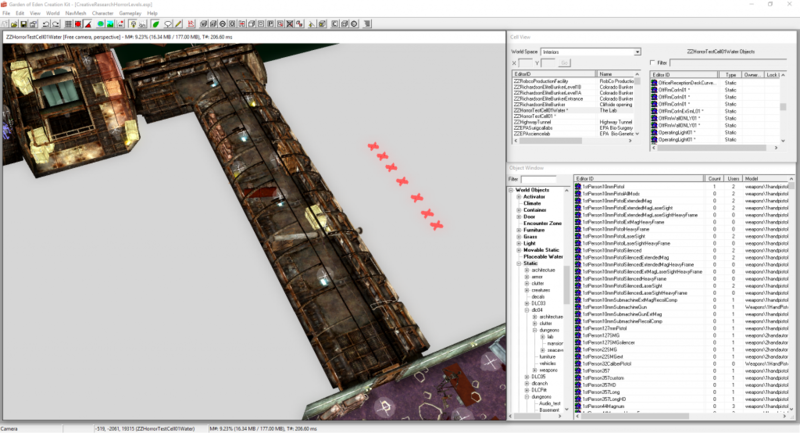 Once they reach the left, the level will fade out as the player is surrounded by multiple creatures. I am happy with it, especially since there are less chances of the player getting lost in this level compared to the previous one as it is simpler. However, as a consequence I worry that I may not have many chances to play with pacing (due to the length of the level), as well as introduce a few scripted sequences to scare the player, as I won’t have much space to work with. After thinking about it, and weighing up the pros and cons, I’ll be taking forward by second level design and be building that up as my final playable level. I’ve been designing another level, iterating on the concerns of the previous one. Once again, the aim is to get from the circled “x” to the uncircled one. To combat the issue of the previous level, with it being too linear while also having too many pointless rooms, I’ve added a few alternate paths for the player to be able to take, and added an actual purpose for players to get into certain rooms. If you look at the central area, you’ll notice that there are a few hallways that double back on themselves and create a circle-like shape. I intend for these to be areas the player will use to pull away from the creature that pursues them. There’ll also be very few rooms that won’t have a purpose – Since this level has paths doubling back on themselves, I could introduce some basic puzzle elements, such as switches you have to find to unlock certain doors, while under pressure from the pursuing creature. I very much like this level, but I’ll give another design a go first and see where it goes.